District 2 residents are now enjoying a new neighborhood park, complete with features for both children and adults. 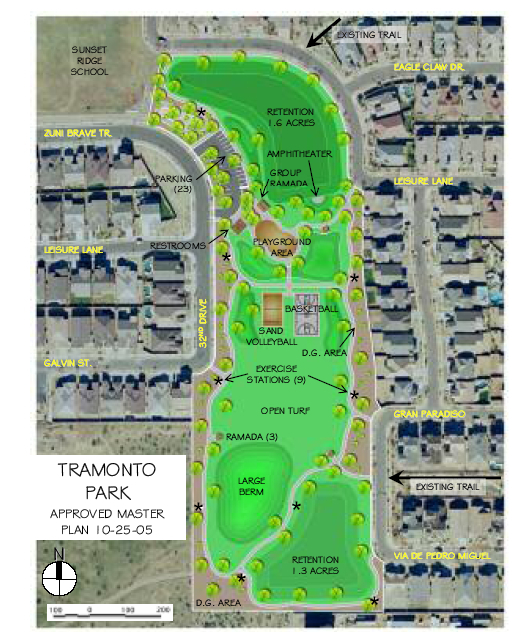 The newly named Tramonto Park resides on a 12-acre site at 31st Drive and Via De Pedro Miguel. It includes a children’s playground, four ramadas, area lighting, sidewalks, lighted sand volleyball courts, lightedbasketball courts, a small amphitheater, a nine-station exercise course, a parking lot, restrooms and plenty of liberatingopen space. The Parks and Recreation Department worked closely with residents of the area on the park’s name and design. Anine-member advisory committee spent three months planning and then in September conducted a public hearing that drew 120 residents. Of those who attended the meeting, 84 percent approved of the design plans and 73 percent approved of the name for the park. The council office appreciates the strong neighborhood involvement in these exciting plans.